For his new case study ‘Social Media and Viral Marketing at ESCP Europe, The World´s First Business School (est.1819)’ , Professor Andreas Kaplan (disclosure: also my boss at the time!) asked me for an interview, alongside other colleagues. It was a good opportunity to think about what my job actually was :). You can find much more information on running social media and viral marketing in Higher Education and in business schools by reading the whole case study. Being a lecturer in marketing from time to time, I also think that it would be a fresh and original case to teach. Here is my interview, thanks to the kind authorisation of Prof. Kaplan. A recent viral marketing campaign at ESCP Europe: ‘The European Lift’, a short film coproduced with La Netscouade and Cut Cut Prod. · When you joined ESCP Europe, what was your first impression of its social media strategy? The social media strategy was quite different from the one I defined in my previous job, especially because many people here are posting in various languages, on many accounts. What I experienced before was a single social media manager posting mostly in one language, on a few corporate accounts. At ESCP Europe, there are corporate accounts, but also local campus accounts and programme accounts, yet it is important to coordinate all these activities, and make the social media presence consistent. · What were changes you undertook with respect to ESCP Europe’s presence on social media? The main frame was already in place. I, however, added a few things and brought the defined strategy further into reality. One was to define more precisely the targets and goals of each channel. I also worked a bit on the editorial guidelines: what topics should be discussed, where, and on which format. I also encouraged more people to post, for example on LinkedIn, where now five people can post. Basically I made an emphasis on two aspects, content and conversation. The content should be adapted to each and every account, and be interesting, for example useful or entertaining, to people who follow us. It also should be shareable, in order to drive word of mouth. The conversation part means that everybody posting on social media should try to actively interact with people: ask their opinion, answer questions or provide additional resources. The “conversational” strategy also applies by developing a proactive social media presence built on our live events (live tweets, reports on Storify, etc.). The next thing we want to improve is the analytics part. · How would you describe your role at ESCP Europe? What attributes does a good community manager need? As a digital manager, a large part of my role is to address, train and advise people. As many people post on ESCP Europe, it is important to still have a common voice and a similar approach of the way we run social media. As for community management, I think you first need to love interacting with people. Be humble; listen to them and their conversations. Also, a good understanding of basic marketing principles is key. The good old « satisfy consumers’ needs » is very relevant on social media. They don’t want to read any blunt advertising messages but things that are interesting to them in a language they understand and they relate to. We have to please our fans or followers with every piece of content we post, otherwise… they will unfollow and leave us! Community managers also must be results orientated: If some posts don’t work, it should be insightful for the next ones. We must make sure that what we do on social media is efficient and in-line with the global branding, communications, and marketing strategy. · Are there any advantages and/ or disadvantages in having to coordinate several different social media across the 5 campuses and the various programmes in comparison to a completely centralised approach? Running many accounts allows us to be more accurate to many different targets. For example we can choose to address potential candidates on one channel and to speak with the current students on another one. It also allows us to express different aspects of the brand, by emphasizing one or another across the channels. The other aspect of our strategy, i.e. many people are posting – sometimes on the same account – allows us to provide consistent flows of content and information. The strategy seems adapted, especially because we operate in several countries. For example, it would be difficult to reach and engage Italian targets with a centralized account from Paris tweeting only in English and not having personal connections in Italy. Above all, social media management is social; it is about knowing the kind of people you talk to and being able to interact with them in a more or less informal way. · How do you know if everybody sticks to the guidelines and respects the specific objectives given to each social media application? I look regularly on each account but of course it is impossible to control everything – and eventually not a good idea. Obviously our guidelines are not always followed thoroughly but it is mostly due to people forgetting them and not because of bad intentions. I meet the people who run the accounts on a regular basis and talk to them often. Therefore there are many occasions to repeat guidelines, explain more deeply specific tools and to share best practices. I also write an annual plan with some objectives for everyone who uses social media at the school. Sometimes you also have to be strict, e.g. blatant advertising messages are strictly forbidden! Of course we sometimes use paid advertising on social media, but that is another story. · What, according to you, are success factors of social media usage within a business school environment? First you need to carefully choose to whom you give social media responsibilities to. Even if social media can affect every area within an organization, I believe social media is not for everybody. Of course not saying social media people are better people, but having online and public conversations requires some specific mindset and abilities such as being humble, a good listener, and not being egocentric. To be successful, social media management should be done strategically; it should not be done because everybody does it. Social media should serve the global strategy. Also instead of planning everything in advance and trying to control everything, one needs to follow a bit of a trial-and-error approach with testing new things on different social media applications. This makes our presences more human and less formal, less a « professional sales pitch ». · How about if you get negative comments on some social media post by students and/ or alumni? How do you deal with this? We recently had a problem with a video on one of our programmes. After we posted the video on Facebook, we received a couple of negative comments from some alumni. Not a lot, yet very detailed ones. One of the common critics was the lack of consistency of the students’ testimonials and a general storytelling approach. In this case, we thought there was a misunderstanding of what the video was about. As the students were interviewed during their very first day at ESCP Europe, they couldn’t go into depth on what the school was and what the programme specifically stands for. As a result of the critique, we simply decided to change the name of the video on YouTube, making it clearer that it was students’ « first impressions » rather than the whole « student experience » one can have during the scope of the programme. After explaining this change and answering the negative comments on Facebook, the discussion stopped and some alumni and students acknowledged us for this change. The lesson from this is: read the comments, try to understand why they are negative, and answer by giving considerations to this feedback. But it is not always possible to change something – and often not a good idea. We must be consistent with the general strategy and can’t be driven by a few complaints, as this doesn’t necessarily represent the majority. Nevertheless we are always listening to our followers and respond to all comments and questions on our various applications in a respectful manner. We never censor any negative comments directed at the school on any of our social media. After all, our students and alumni only want the very best for their school! However, in some cases comments need to be deleted (e.g. : insults targeted to other students or faculty) or not be taken that seriously (e.g. : trolls). · Can you talk more precisely about your activities on the four main social media applications, i.e. Facebook, Twitter, YouTube, and LinkedIn? · What is the link between the school’s website and its various social media presences? On the one hand, we share some website content on social media, e.g. news and events. One of the goals of social media is also to drive traffic to the website and improve SEO. On the other hand, we display social media content on the website, e.g. Twitter plug-ins or FlickR photo galleries. It helps to make the website more dynamic and lively. · There are more and more rankings popping up classifying different business schools according to their social media activities. What is your opinion on them and what is the strategy? The problem is that all these rankings mainly focus on the numbers of followers, likes, etc… Since it’s possible to buy fake fans and followers, or even to have a lot of real followers but no interaction, it seems to me these ranking don’t really reflect the efficiency of social media activities. For example, one can have 20,000 fans on Facebook, and at the same time post something reaching only 350 people, because of the Facebook EdgeRank limitation: Posts on Facebook which get few likes worsen the visibility of further Facebook updates on the liker’s newsfeeds as a result of this algorithm Facebook applies. This is a further reason why updates need to be interesting, engaging, and not plainly promotional. Also with respect to rankings, how can we compare tools, if they are used for very different goals? But in the meantime, we still have a look at these rankings… and students and candidates might do so too. However, we would never buy likes or followers – at ESCP Europe we prefer to stay honest with these things. · What are your plans with ESCP Europe’s social media strategy and how do you see it within a five years time frame? We still need to improve our actual framework and organization. I would like to make the different editorial lines more precise, and to foster our content strategy. I would like each of our social media accounts to look different one from the other, with even more specific content and operations, even if we are one brand, and therefore show overall consistency particularly on our European, cross-cultural positioning. On some of the presences we could be more active such as Google+ or Instagram. We need to be able to run better analytics, to make sure that what we do is really useful, and to provide us with information, which allows us to do better in the future. Also I think social media will affect other parts of the school, for example admissions. Another idea is to involve more the students, staff, and professor in the production of content and in online interactions. I think we definitely need to rethink our mobile presence. It is difficult to predict what social media will be available in five years, as everything changes very fast in this area, but if we continue to focus on the quality of the content as well as on interactions with our followers, we will be able to adapt to new tools and trends very quickly. Kaplan A. M. (2014) Social Media and Viral Marketing at ESCP Europe, the World »s First Business School (est. 1819), European Case Clearing House, 514-058-1, 30 p.
Conversation de marque: est-ce bien nécessaire ? Le thème de la conversation revient comme un mantra dans la sphère du marketing: il faut entrer en conversation, on n’est plus dans un monologue mais dans un dialogue, une relation d’égal à égal entre marques et consommateurs. Autant de poncifs qui ne résistent pas à l’analyse (*). De mon point de vue, la conversation de marque est une technique marketing comme une autre, qui permet de répondre à certains objectifs, comme renforcer l’image de marque, développer la notoriété, améliorer l’expérience de consommation ou encore faire du crowdsourcing. On parle ici d’une conversation de marque « réussie ». Mais que se passe t-il quand la conversation dérape ou simplement qu’elle est décevante ? Quel est l’impact sur la marque ? Répondre à ces questions nécessiterait une étude plus approfondie. Je me limiterai ici à passer en revue 3 situations dans lesquelles il est difficile d’établir un dialogue « constructif » avec les internautes. Souriez, vous êtes trollés ! Personnage bien connu des espaces participatifs en ligne, le troll commente les posts en détournant le sujet ou en répondant « de façon non appropriée » du point de vue de la marque. Cette situation peut intervenir quel que soit le message initial. Sur n’importe quel sujet, il y aura toujours un troll pour vous répondre ! 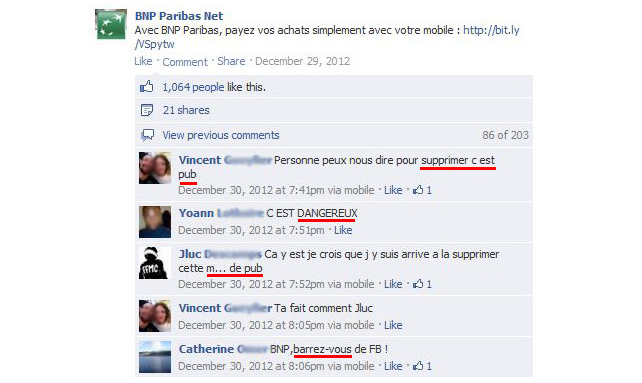 Quid des commentaires peu qualitatifs : orthographe, vocabulaire, arguments ? Les marketeurs ont souvent une haute opinion de leur marque et peuvent avoir du mal à répondre à des commentaires jugés médiocres. Solution 2: Ne pas répondre si vous considérez que ce n’est pas au niveau de la ligne éditoriale de votre marque. Facebook ne cesse d’innover en matière publicitaire. On peut « pousser » un post au delà du cercle des abonnés à la page, simplement en lui allouant un budget. Mais gare aux conséquences : on gagne en visibilité ce que l’on perd en pertinence. En effet, un message s’affiche au beau milieu des actualités des amis de tout un tas d’inconnus. Ces derniers n’ont jamais émis le moindre souhait de voir vos posts et encore moins de nouer une conversation avec votre marque. S’ils n’adhèrent pas au message, le feedback peut être violent. Solution : Utiliser les posts sponsorisés avec beaucoup de précautions.! Si vous avez échappé aux trolls, que les commentaires sont de qualité et que vous échangez avec de « vrais » fans, une conversation peut effectivement s’établir. Mais ces conditions sont rarement réunies, notamment sur Facebook. De même que la conversation des salons mondains du 18ème siècle comprenait un nombre réduit de participants cooptés, la conversation de marque pourrait bien ne s’épanouir que dans des espaces plus privatifs. Elle peut alors révéler ses vraies vertus, au lieu de donner lieu à un babillage stérile conditionné par la mode du tout-participatif. (*) Voir : Karine Berthelot-Guiet, Caroline De Montety, Maxime Drouet, Valérie Patrin-Leclère et al. (2011) : Dossier: « La communication revisitée par la conversation », Communication & Langages. (**) Concept de « Defensive Trolling » développé par Alexandre Kane (2012) « Processus de fusion entre business schools : comment utiliser les réseaux sociaux pour réunir les communautés. Risques et opportunités », Conférence Réseaux Sociaux: Les tendances 2012, EducPros.